An archive devoted to former University of Liverpool Head of Composition, James Wishart opens today to coincide with the Lunchtime Concert performance of his work, 23 songs for a Madwoman. Housed in the University’s Special Collections and Archives, at the Sydney Jones Library, the James Wishart Archive contains all his compositions and should prove a rich resource for those interested in the music of the late 20th and early 21st centuries. The cataloguing of James Wishart’s output was undertaken by Department of Music third year student, Ellie Pickles. Ellie said: “James’ work can generally be seen as the continuation and development of modernism in music, as found in composers such as Luciano Berio, Morton Feldman and Peter Maxwell Davies. 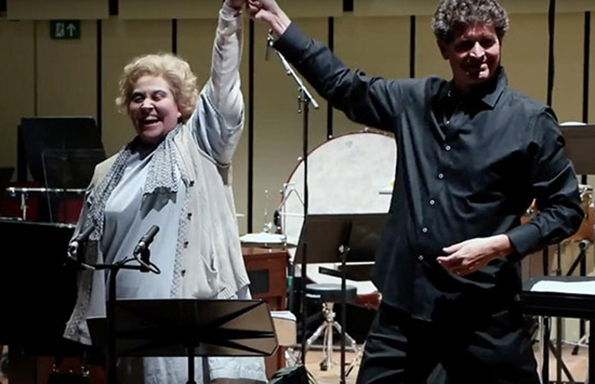 The archive launches today to coincide with the Lunchtime Concert performance of Wishart's 23 Songs for a Mad Woman (2006); performed by Louise Ashcroft (vocals), the Royal Liverpool Philharmonic Orchestra’s (RLPO) Ensemble 10/10 and conductor, Clark Rundell. Writing in 2006, James Wishart said his piece invites the audience to “imagine a slightly voyeuristic experience looking in on a scene in some kind of mental institution”. Like Peter Maxwell Davies and his Eight Songs for a Mad King, Wishart does not clearly identify the protagonist of the work, although “you might conclude…that she is Margaret Thatcher”. He writes: “Whichever way you interpret the dramatic situation, there is a clear degeneration during the 23 miniature movements of this work. “Moments of clarity emerge, a recognisable personality takes shape, and then (elusively) it falls away from your grasp. James Wishart was a member of the music staff at University of Liverpool from 1980 to 2013, and was active as a composer, pianist, conductor and writer on music throughout that time. He described himself as “capable of gratuitous insult and unsubtle smear”, calling his work “satire in the raw” that follows his interest in the “whole area of political drama expressed via music”. James Wishart suffered a serious stroke in the autumn of 2013, suspending progress on planned future works. The 23 Songs for a Madwoman was premiered by Louise Ashcroft and the RLPO’s Ensemble 10/10, conducted by Clark Rundell, in October 2016 to great acclaim. This performance has been made possible through the University's partnership with the Royal Liverpool Philharmonic.